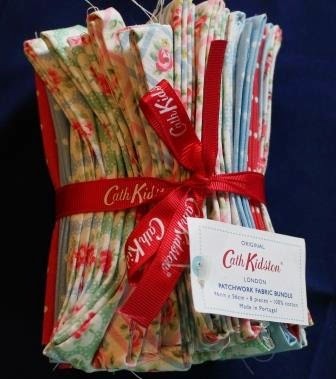 I received a lovely gift for my Birthday, a pack of Cath Kidston Fabric. I discovered Cath Kidston on my recent trip to London. As I wrote here, she is one of my favorite designers. This is the Patchwork Fabric Bundle with 8 pieces of cotton fabric in various prints that each measure 46 cm x 56 cm (a fat quarter in U.S. terms). 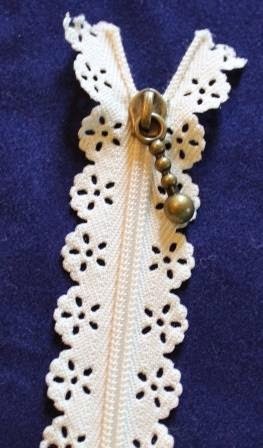 The perfect item to add to some of this fabric is this lace trimmed zipper that I purchased when I visited the Victoria and Albert Museum on the same trip to London. I went to the Wedding Dress exhibit and it was fantastic. The fabric is 18 inches wide so I cut it in half, starting with a piece for the front and one for the back that was each 9 inches wide. 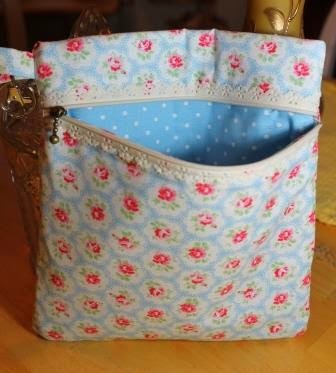 I chose the blue polka dots fabric for the lining and cut that to the same measurements. I added a thin batting to give the purse some stability. I used a 12 inch length to start. The zipper is sewn to the right side of the fabric. Before sewing the zipper. I seamed the lining fabric to the outside flowered fabric. Sewing the zipper was tricky. This is the first time that I sewed a zipper to the outside and I was careful that the seam didn’t prevent the zipper from opening and closing properly. Once the zipper was in place, the rest was simple. I made the top fold 2 inches above the zipper and trimmed the front piece 7 inches. 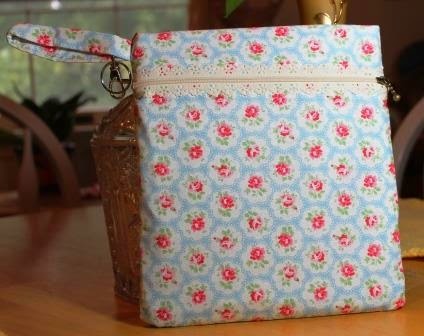 With right sides together, I sewed the side seams of both the bag and the lining and then sewed the bottom seam of the bag pieces. Turning it was a challenge. I unzipped the zipper and turned the whole thing so that the lining was on the inside. The last seam was the bottom one for the lining. I did that seam on the right side of the fabric. That’s it. Here’s the purse. It took about 3 hours. The finished measurements are 9 inches long and 7 1/2 inches wide. It’s a great size for one of my smaller knitting projects or when I need to just carry my phone and keys. I have six more beautiful prints to work with. I think the next one will be used for a doll dress for my Dressing our Dolls collection. After that, I’m not sure.